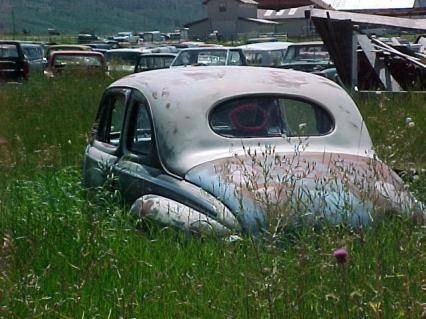 JunkYard in Idaho Photo Picture Classic Cars for sale & Classifieds - Buy Sell Classic Car & Classic Truck Classifieds. Post war Ford coupes are nice. I have had a couple of them as street rods. Nice drivers. Parts are easy and cheap to come by. that bus woul make a cool car transport a C-60 chevy?? i would love that coupe!i wouldnt care if i had to do a little weedwhackin' to get it out! GREAT PICs!!! they remind me of those calenders you see with OLD rusty cars on them..
gmc, how much for your truck? That chevy truck looks like someine restored it at one time. No telling what might be under the hood. Looks like they ran into something and lost interest. They may really look at you funny if people see you crusin in that school bus.